View More In Pull Chains. 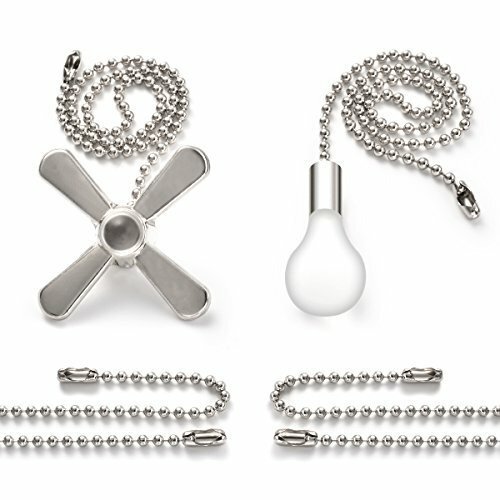 Decorative fan-shaped and bulb-shaped round beaded pull chain set, applies to most ceiling fans. functional and decorative, strong and rust-resistant, cuttable and extendable, easy to attach to ceiling fans. With two 36" extensions and four extra connectors, the chains are cuttable and convenient to extend the length of the chains with connectors, easily attach it to your ceiling fan. The chain is made of brass which keeps the chain from rust, better than chains that are made of iron. strong and rust-resistant. Help you identify the right chain. Never pull the wrong chain again. Beautiful color and practical shape design, functional and decorative. Simple design makes it easier match almost room décor. If you have any questions about this product by Sunix, contact us by completing and submitting the form below. If you are looking for a specif part number, please include it with your message.